How will Qatar respond to list of demands? The 13-point list of demands was delivered overnight on Friday by Kuwait, which is mediating between Qatar and its neighbors. The situation between Qatar and several Arab countries deteriorated earlier this month after Saudi Arabia, Egypt, the United Arab Emirates and Bahrain cut ties to Qatar over allegations the country funds terrorism. The dispute has plunged Qatar into chaos and ignited the biggest diplomatic crisis in the Gulf since the 1991 war against Iraq. Those four countries have now given Qatar 10 days to comply with all of the demands. The Associated Press, which has obtained a copy of the list, reported that one of the demands called for Qatar to sever its diplomatic ties to Iran. 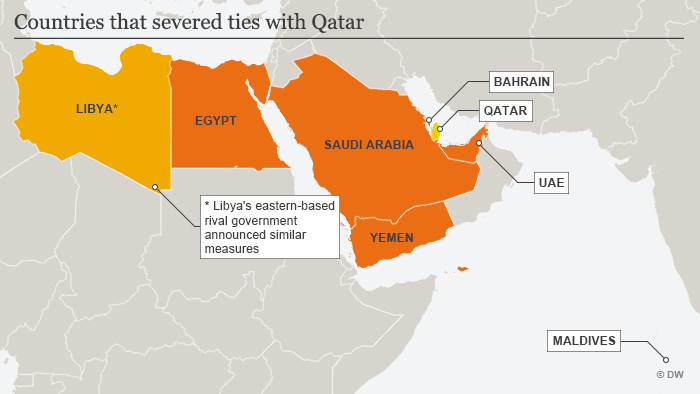 The list also contained demands that Qatar close down a Turkish military base on its territory and shut down Doha-based broadcaster Al-Jazeera. Doha has denied financing extremism. However, it remains a key patron of the Islamic Hamas movement, which rules the Gaza Strip, and is also seen to support the Muslim Brotherhood, a Sunni political group that is opposed to monarchical rule, as is practiced in many nations of the Middle East. According to the list, Qatar must refuse to naturalize citizens from the four countries and expel those currently in Qatar. It must also deliver individuals accused of terrorism in those four countries and stop funding groups that are designated as terrorist by the United States. If Qatar agrees to comply, The Associated Press reported, it will be audited once a month for the first year, and monitored regularly over the next 10 years. Qatar has said it will not negotiate until the boycott is lifted. Responding late Friday, Qatar’s Foreign Ministry said it was studying the demands of “siege countries and Egypt” and would develop an appropriate response. Turkish Defense Minister Fikri Isik told local broadcaster NTV on Friday that his country had no plans to review its military base in Qatar, and dismissed demands for its closure as interference in Ankara’s relations with the oil-rich Gulf state. “The base in Qatar is both a Turkish base and one that will preserve the security of Qatar and the region,” said Isik. On Thursday Turkey sent a small contingent of soldiers and armored vehicles to Qatar, after a fast-tracked legislative change allowed for more troops to be deployed there. Turkey has been one of Qatar’s key backers during the crisis, sending food and other supplies to help Qatar weather the embargo. Overall, Turkish exports to the Gulf state have tripled from their normal levels in the three weeks since the embargo began. Meanwhile, Turkish President Recep Tayyip Erdogan held talks with Saudi leaders on how to calm tensions and come to a diplomatic solution.